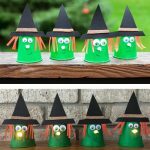 Our paper cup witches have been a big hit with both my boys and our readers. 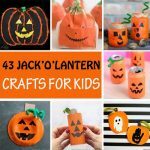 So I decided to make a Jack’O’Lantern version to go along. 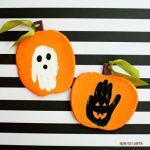 It turned out so adorable that I can’t make up my mind which are my favorites – the witches or the pumpkins. Right now they are side by side on our fireplace. 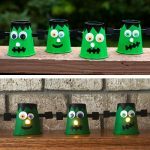 On a gloomy day like today, they all look so fun and funny with their noses glowing in the dark. 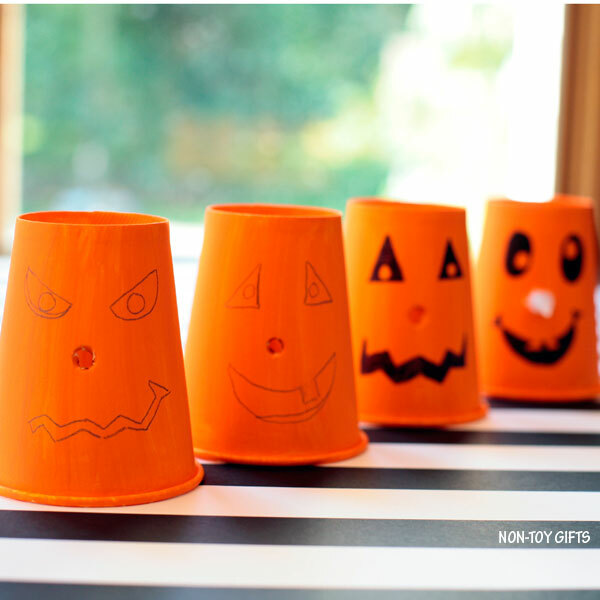 I’m even thinking of turning this into a whole series of paper cup Halloween crafts and adding Frankenstein, vampires and ghosts. 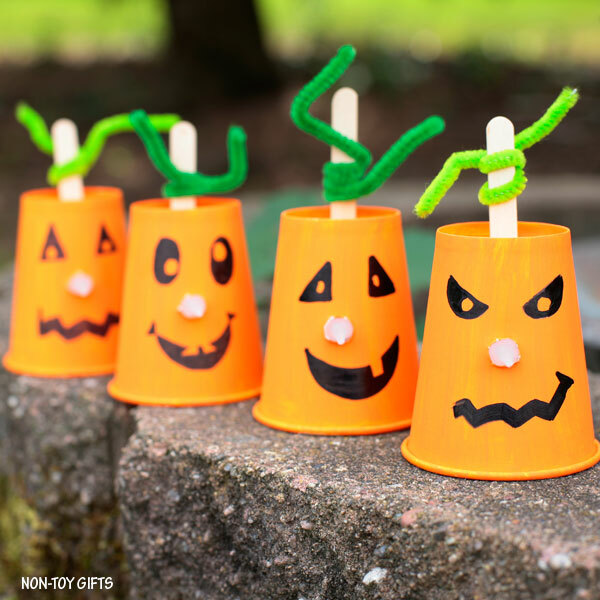 They will be all simple to make like the rest of our 100+ easy crafts for kids. 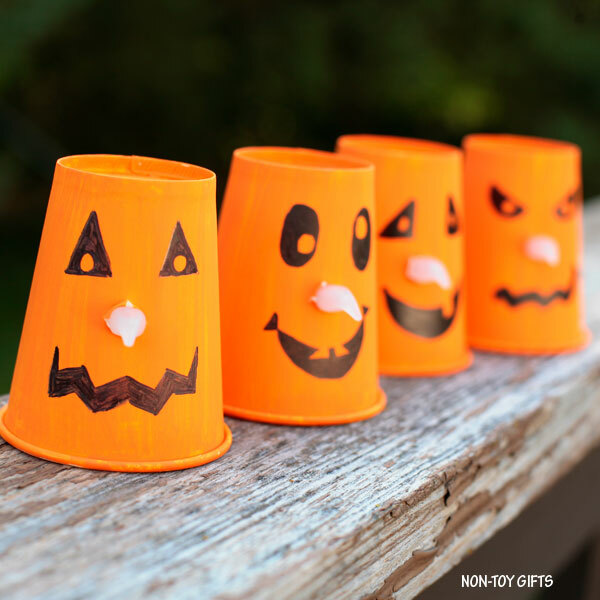 You can chose between two versions when creating these paper cup Jack’O’Lanterns. 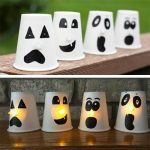 The easier version would be to just paint the paper cup, draw the face and add the candle light for the nose. 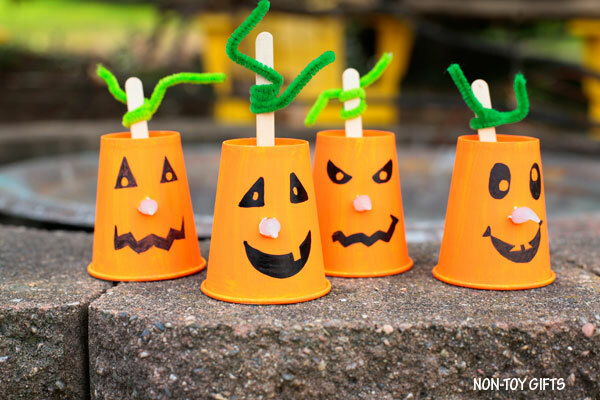 You can take it a step further and add a craft stick for the stem and a green pipe cleaner for the leaf. 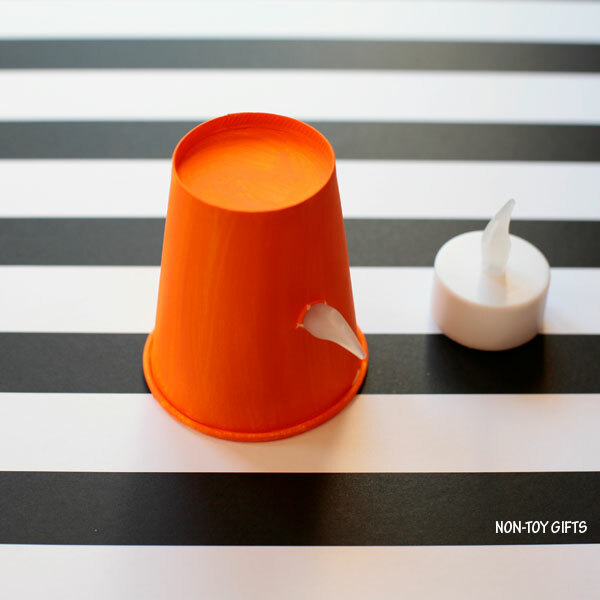 This requires making a little slit on top of the paper cup and because you will need to use a craft knife, this will be an adult only step. 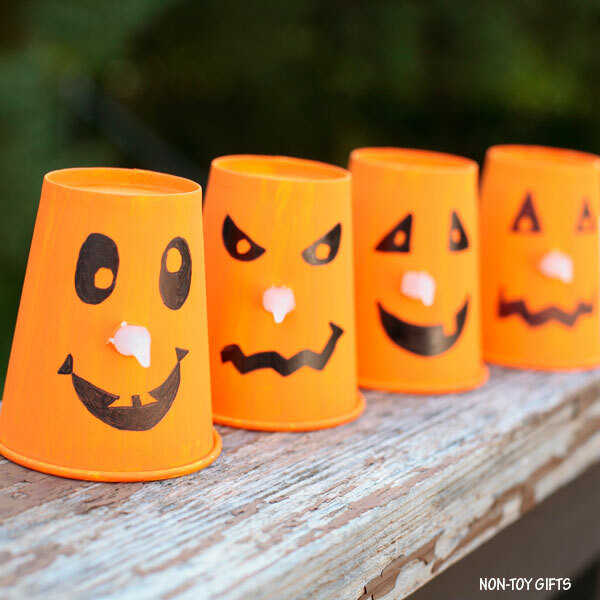 Start by painting the paper cups orange. Wait for the paint to dry completely and apply another coat. 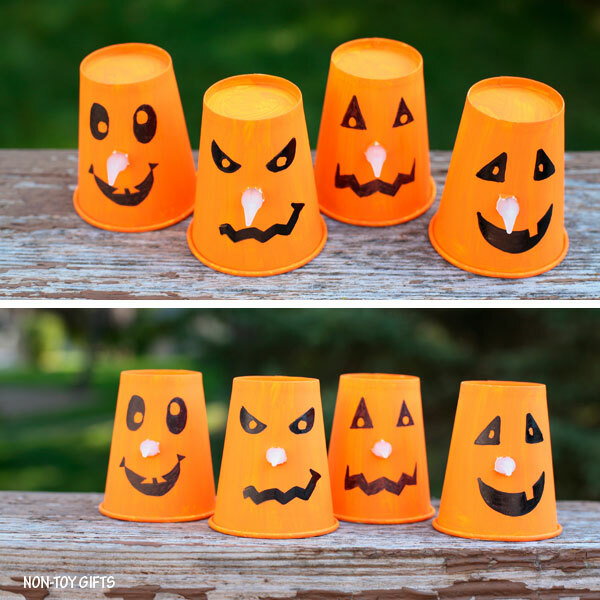 You can skip the painting step and use orange paper cups instead. 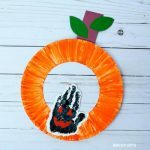 This would be great if you’re crafting with young kids who don’t have enough patience to wait for the paint to dry. 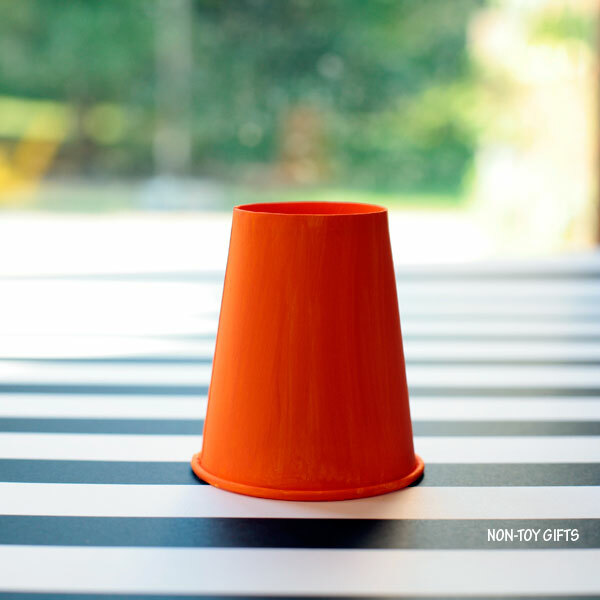 Once the paint has dried completely use a pencil to poke a little hole in the middle of the cup. You can add the light candle now, if you like to, but I found it easier to do the face drawing first and only then add the candle. 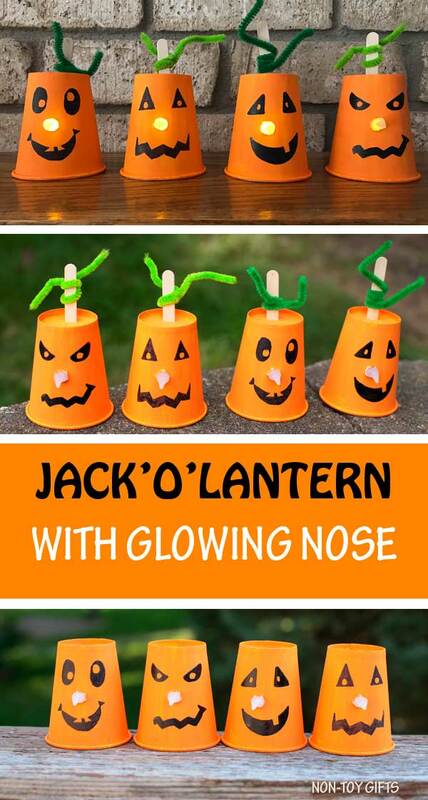 Use a pencil to outline the eyes and mouth and then a black marker to draw the Jack’O’Lantern faces. 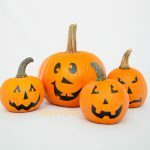 I used as inspiration these no-carve Jack’O’Lanterns we created a few years back. 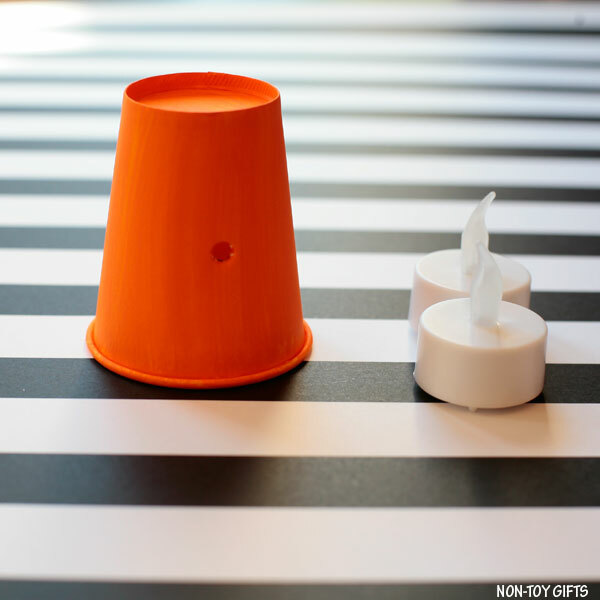 Slide the “flame” of the tea light candle through the hole from the inside. 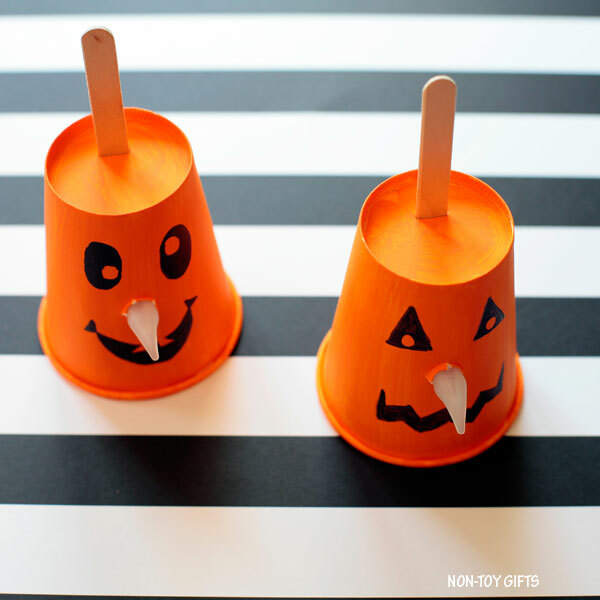 If you want to add the stem and leaf, use a craft knife to make a little slit on top of the paper cups. (adult only step). 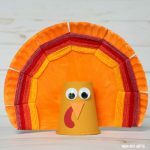 Slide a craft stick through the slit and wrap a green pipe cleaner around the craft stick. Cut it at the desired length.